Just like grandmas and Guy Fieri, chimpanzees love to gab about food. Researchers have recently found, in fact, that chimps have distinct sounds for certain types of fruits, and will call out to other chimps when they find the most bountiful trees. Ammie Kalan, a primatologist and Ph.D. student at the Max Planck Institute for Evolutionary Anthropology in Germany, and her colleagues recorded a variety of chimpanzee vocalizations at Taï National Park in Cote d'Ivoire. Though chimpanzees don't quite have what we would consider language, Kalan told The Dodo, "their communication system is impressive in its own right." On average, chimpanzees reserve the highest-pitched calls, the scientists reported in the journal Animal Behavior, for a fruit called Nauclea diderrichii. The chimpanzees spent the most feeding time on these fruits, which Kalan noted are high in energy. Certain food calls also drew other chimpanzees to the biggest Nauclea trees, Kalan said, where they gather at the trunk to eat fallen fruit. Eating together is good for chimps, too - when chimps nosh as a group, a 2014 study found, their familial bonds deepen. "I strongly believe that we will only be able to unravel the mysteries of chimpanzee communication by studying them in their natural habitat," Kalan said. "Unfortunately, chimpanzees in the wild are highly endangered across Africa." Chimpanzees are remarkably responsive to the pressures humans place on their habitats - for example, by eating more figs or becoming night owls to sneak into cropland. But there's a limit to how far we can push these endangered animals. 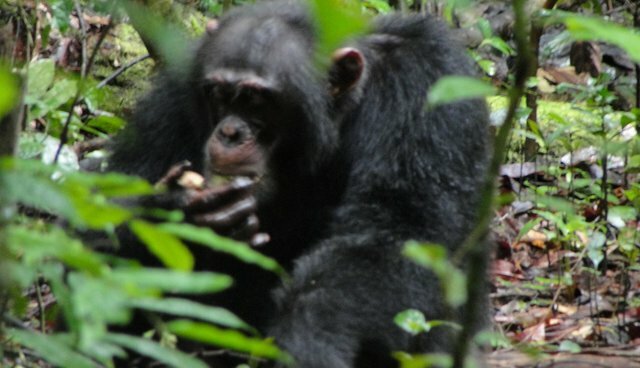 Kalan urged those interested in helping chimps to support groups like the Wild Chimpanzee Foundation, which protects the areas where the Taï chimpanzees live.